Welcome to a new summer weekly installment at SKC called Big Apple, Small Basket. 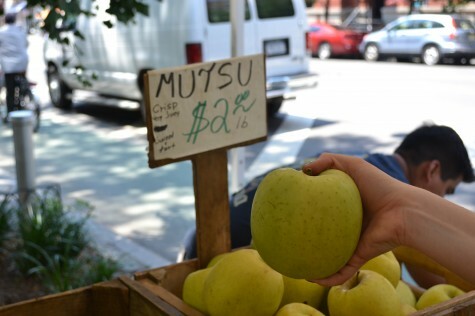 Check back to read more about Kendra’s adventures in finding, maneuvering and cooking summer dishes from the many farmers’ markets in New York City. For Week #1, click here. Guess what? New York is still fun. In fact, New York is awesome. I am knocking touristy things off my list left and right (Staten Island ferry? Done. Gondola thing to Roosevelt Island? Absolutely) and am even starting to feel like a local sometimes. Like when I get off of the subway for work at Times Square and have to repress the urge to yell GET OUT OF MY WAY at the scary giant Hello Kitty and Elmo who want to pose with me in pictures. They’re terrifying. And in my way! They make me want to barge through them while eating a bagel and listening to Jay-Z. Fake it til you make it, am I right? Kendra Vaculin attends Northwestern University and double majors in Creative Writing and Theatre. If she could, she’d spend her summer doing a lot of the first, seeing a lot of the second, and eating. 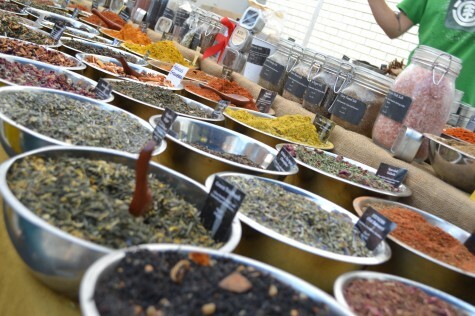 She headed to the upper west side this week for her farmer’s market fix and was so happy about it. 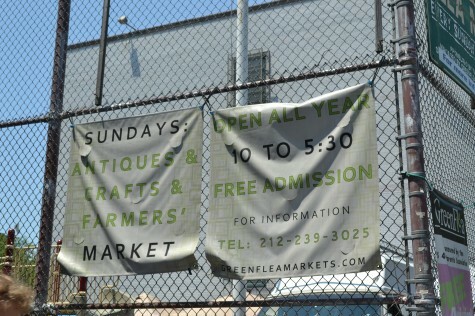 Lining the western and southern edges of the grounds of the Museum of Natural History, this farmers’ market is positively stocked, and even spills over to an adjacent lot on Sundays to accommodate antiques, crafty goods, and other flea market staples. 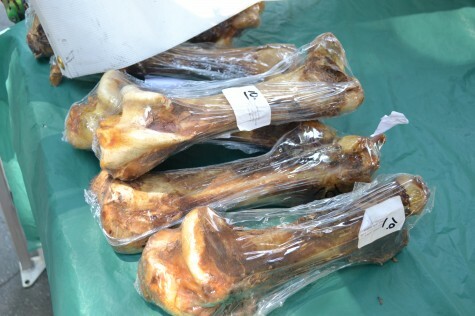 There is a tent with a sign that just reads, “DUCK.” There is a stand selling ostrich in all varieties: burgers, eggs and even (above) bones, which are labeled “NOT for Human Consumption.” There is a man with a chicken marionette who says to passersby, “It’s as real as you make it, folks.” And those are just the bird-related examples. 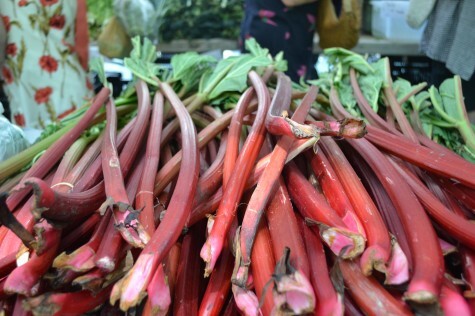 It took a lot of effort to pull myself away from this display by Spices and Tease – it was unbelievably fragrant and manned by a really funny French dude–but I eventually settled on some massive rhubarb. The stalks were as long as my arm and beautifully colored, so I couldn’t say no. Side note: I have something to tell you, and it is that if you go to this market and see a stand selling cayenne-curry jam, you should under NO circumstances think that that product sounds good and decide to eat a sample. DO NOT. EAT. THE SAMPLE. You will spontaneously combust. You will light. On. Fire. I don’t know how to be more explicit. I was engulfed in flames both inside and outside of my body. I like spicy things usually and this was just not one of those things. My friend and I ended up spending way too much money on watermelon just to return ourselves to normal temperature/put out the inferno in our mouths. So. Anyway. Avoid the jam. 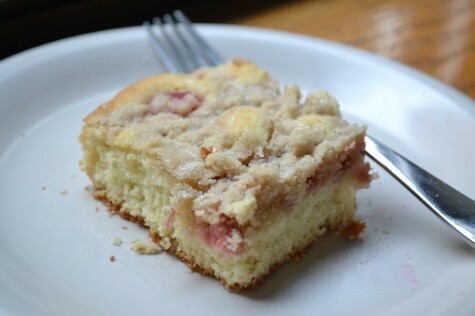 Mix rhubarb, lemon juice and 2/3 cup sugar in a bowl and let sit. On medium speed, cream butter, lemon zest and remaining 2/3 cup sugar. Add eggs and beat until combined. In a separate bowl, mix together flour, baking powder, salt and ground ginger. Add half of the dry mixture to the butter mix and beat until incorporated. Add half of the sour cream, then the remaining dry mix, and then the last of the sour cream, combining after each addition. Stir together the topping ingredients with a fork until it resembles a coarse crumb. Dump batter into a greased and parchment paper-lined 9×13-inch baking pan. Smooth until even. 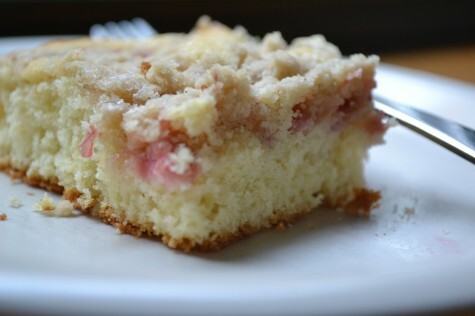 Top with rhubarb, and then the crumb mixture. Bake for 50 minutes – an hour, or until a fork inserted at the center comes out clean. Either cut into 2 inch squares to serve, or eat so much for breakfast with your best friend that you think you’re gonna be sick, and then two hours later eat pizza. Viva NYC. You could definitely see your skills in the paintings you write. The sector hopes for even more passionate writers such as you who are not afraid to mention how they believe. Always go after your heart.